[a] College of Pharmacy, Gachon University, No. 191, Hambakmoero, Yeonsu-gu, Incheon 406-799, Republic of Korea. [b] Pharmaceutical Resources Botany Laboratory, Department of Pharmacognosy, College of Pharmacy, Chung-Ang University, Room No:416, bldg. : 102, 221, Heukseok-dong, Dongjak gu, Seoul 156-756 Republic of Korea. [e] Department of Applied Plant Sciences, College of Agriculture and Life Sciences, Kangwon National University, Chuncheon 24341, Korea. The main aim of the study is to investigate the phytochemical screening of C. decapetala along with the content determination of different species of genus Caesalpinia with respect to their antidiabetic activity and identification of most bioactive species belonging to different origins. To achieve our goal different species of genus Caesalpinia collected from China and Pakistan were subjected to open column chromatography, High Pressure Liquid Chromatography (HPLC), antioxidant, and antidiabetic assays for evaluation. From η-BuOH fraction of C. decapetala extract, eight compounds were isolated using open column chromatography and identified as apigenin-7-rhamnoside (1), 4-O-methylepisappanol (2), caesalpinol (3), daucosterol (4), astragalin (5), kaempferol (6), quercitrin (7), and naringin (8) using Nuclear Magnetic Resonance (NMR) spectroscopy. HPLC analysis of different species of genus Caesalpinia showed that the most active antidiabetic compound ‘quercitrin’ was present more in C. pulcherrima followed by decreasing order in C. sappan,C.decapetala, and C. bonduc. The results indicated that quercitrin is the most bioactive content and C. pulcherrima is most bioactive specie of China origin from genus Caesalpinia. The present study reveals that quercitrin is the lead bioactive compound and C. pulcherrima is the most bioactive specie of genus Caesalpinia with high amount of quercitrin. The result indicated that extract of Caesalpinia pulcherrima can be commercialized as a source of antidiabetic agents. Chronic hyperglycemia, a major characteristic of diabetes mellitus (DM), is responsible for the deregulation of energy metabolism. Consequently, there is either the failure of production or response to hormonal insulin. Continued hyperglycemia due to DM causes varieties of dysfunctions and complications including renal disease, peripheral neuropathy, cardiovascular diseases, myocardial infarction, and non-healing foot ulcer.1 There is growing evidence that reactive oxygen species (ROS) is the major cause of stimulating DM mechanisms2, 3 and responsible for the initiation of lipid peroxidation, enzyme deactivation, alteration in the collagen structure, and function.3, 4 In other words, we can say ROS have long term effects on the progression of diabetes. Therefore, by using the antioxidant, the oxidative stress caused by these ROS can be relieved, thus reducing the risk of damage to the pancreas. Carbohydrate hydrolyzing enzymes including α-glucosidase may be utilized for blocking the breakdown of starch and disaccharide into glucose and made glucose less available for absorption into the blood and ultimately sugar elevated level into the blood can be controlled.5 Protein tyrosine phosphatase 1B (PTP1B) is considered as the main regulator of body stored body fat, insulin resistance, and energy balance. Insulin controls various functions at the level of gene transcription, protein translation, and enzyme activity. PTP1B is the negative regulator of insulin signaling mechanism. It improves the insulin sensitivity in obese patients. Deletion of overexpression of PTP1B could be an effective and potential therapy for ameliorating diabetes and obesity.6 Therefore, by considering these causing factors, diabetes can be controlled and ameliorated. Many types of medicinal plants and their extracts have been reported with significant antidiabetic activity due to the presence of phytochemicals which are responsible for providing protection from disease prevalence. C. decapetala (CD), known as Roth, is a pantropical genus belonging to family Fabaceae around 120-1250 species of tree, shrubs and lignans. Traditionally, several species belonging to genus Caesalpinia have been known to possess properties as anti-inflammatory, antidiabetic, hepatotoxicity, wound healing, and fever.7 Recently a study was conducted which proved the traditional use of extract of C. decapetala against diabetes8, but no study was reported yet which identify the responsible phytochemicals playing role in diabetes prevention. Therefore, the current study was designed to investigate the phytochemical screening and content determination of different species of genus Caesalpinia belonging to different origins with respect to their antidiabetic activity and the identification of most bioactive specie. Acetonitrile, Methanol (MeOH), Water, Formic acid HPLC-grade (Daejung, chemical, Korea), Hexane (Hx), Ethyl acetate(EA), Dichloromethane (DCM), and n-Butanol (n-BuOH) (Daejung, chemical, Korea), MeOH-d4 (Sigma-Aldrich, USA), Phosphoric acid HPLC-grade (Daejung, chemical, Korea), Dimethylsulfoxide (DMSO) (Sigma-Aldrich, USA), ascorbic acid (AA), dinitrosalicylic acid, trolox, Acarbose, pyragallol, sodium chloride, sodium phosphate mono basic, sodium phosphate dibasic, xanthine oxidase, nitro blue tetrazolium (NBT), ethylene diamine tetra acetic acid (EDTA), 2,2’-azino-bis(3-ethylbenzthiazoline-6-sulfonic acid) (ABTS), α-glucosidase, ρ-nitrophenylphosphate (ρNPP), DPPH (2,2-diphenyl-1-picrylhydrazyl), 4-nitrophenyl β-D-glucopyranoside (ρ-npg), ursolic acid, protein tyrosinase, and phosphatase 1B (Sigma-Aldrich, USA). During the month of July 2013, C. decapetala leaves were collected for isolation of major compounds from Dir, Pakistan and identified by Professor Whang Wan Kyunn. Collections of samples for HPLC analysis were done from South China botanical garden, Guangzhou, Guangdong Province, China, GC University Lahore, and local market from Punjab, Pakistan. All plants specimens were submitted to the laboratory of pharmaceutical resources of the college of Pharmacy, Chung-Ang University, Seoul, South Korea. Air dried 650 g of powdered leaves were extracted with 100% MeOH and dried under vacuum in a rotary evaporator, consequently, about 41 g dry extract was received. The methanolic extract was further partitioned with n-hexane (15 g), DCM (12 g), EA (10 g), n-BuOH) (6 g) and water (10 g) and dried in a rotary evaporator. To analyze the antioxidant property, DPPH assay was performed. Furthermore, thin layer chromatography (TLC) using the mobile phase (EA: GAA: FA: W; 100: 11: 11: 26) for the selection of fraction for further isolation. n-BuOH fraction was selected for further isolation. For isolation of compounds, n-BuOH extract (5 g) was chromatographed on the Sephadex column and eluted with 30% to 80% MeOH which provided 1-7 fractions based on TLC profile. Fractions C. decapetala butanol (CDB) 3, 4, 5, and 7 were further subjected to repeated Sephadex column and ODS column and eluted with MeOH-water (20 to 100%) gradient elution. Fraction CDB 3 was further eluted on ODS column using 40-60% MeOH and gave further 3 subfractions. Finally, CDB 3-2-2 contained compound 1 (23 mg). Fraction CBD4 was further eluted with 40 -60% MeOH on Sephadex column and obtained 3 subfractions. From subfraction CBD4-1, further sub-sub-fractions gave CBD4-1-1 (Compound 2; 17 mg), CBD4-1-2 (compound 3; 11 mg), CBD4-1-3 (compound 4; 8 mg), and CBD4-1-4 (compound 8; 6 mg) by using ODS column with 40-60% MeOH. From subfraction CBD5-4, compound 5 (40 mg) was obtained and from sub subfraction CDB5-4-2-8 compound 6 (15 mg) was obtained. Fraction CDB7 was eluted by 40-60 % MeOH on repeated Sephadex column which gave three subfractions. Subfraction CDB7-1 gave compound 7 (22 mg). For determination of structures of isolated compounds, samples were dissolved in MeOH-d4 (CD3OD) and then analyzed by 1H-NMR and 13C-NMR. The powdered leaves (1 g) of different samples of Caesalpinia species were sonicated in 100 mL of MeOH for 30 min for pattern investigation by HPLC-UV. RP-C18 kromas-il column (250 × 4.6, 5 μm) was used with different gradient of mobile phase (0.1% AA in water (solvent A) and MeOH (solvent B): 0 min, 95% A; 10 min, 85% A; 20 min, 70% A; 30 min, 50% A; 60 min, 95% A). The column was equilibrated with 85% A for 10 min before next injection with the flow rate of 1mL/min at a wavelength of 330 nm. The injected volume was 20 uL. The column temperature was kept at 25°C. Peak analysis and identification were done with standard compounds and retention time using HPLC chromatography equipped with UV detector and further comparative analysis of isolated compounds was investigated. The DPPH activity of the isolated compounds and extract of Caesalpinia species were investigated using the method prescribed.9 In 96 well-plate 20 uL of the sample with different dose of concentrations (1000, 500, 250, 125 ug/mL) and isolated compounds (100, 75, 50, and 25 uM), 180 uL of the 0.1 mM solution was added and incubated for 30 min at 37°C. The absorbance was measured at 517 nm. Each observation was performed in triplicate. Ascorbic acid (AA) and trolox were considered as positive controls. Furthermore, inhibition percentage was calculated. Superoxide anion radical scavenging activity of the isolated compounds and extracts of Caesalpinia species were investigated using the method reported earlier.9 160 uL of reaction mixture containing hypoxanthine 0.6 mM, NBT 0.2 mM, and EDTA 1Mm were prepared in phosphate buffer solution 50 mM containing pH 7.4 was added in 20 uL of test sample of different concentrations (200, 100, 50 and 25 µM) followed by incubation at 37°C for 8 min and measurement was doneat 590 nm. Allopurinol was used as positive control. All observations were measured in triplicate. Percentage inhibition was calculated. ABTS activity of the isolated compounds and extract of Caesalpinia species were investigated in accordance with the method prescribed.9 Stock solution containing 7.4 mM of ABTS and 2.6 mM of potassium per sulfate was prepared and kept for one day in the dark. Later, the dilution of the stock solution was done using the MeOH until the absorbance came within the range of 0.8 -1.2 at 732 nm. To 50 uL of sample solution of different doses (250, 125,100 and 50 µM), 950 µL of ABTS was added. Absorbance was measured at 732 nm using a spectrophotometer. AA and trolox were used as positive control while MeOH was used as negative control. All observations were measured in triplicate. Percentage inhibition was calculated from the observations. Data was presented as the mean ± standard deviation (S.D). Data was analyzed using one-way ANOVA and level of significance were measured at P < 0.05. (a) Chemical structure of isolated compounds from C. decapetala. Apigenin-7-rhamnoside (1), 4-O-methyl episappanol (2), Caesalpinol (3), daucosterol (4), astragalin (5), 6-hydroxy kaemferol (6), quercitrin (7), and naringin (8). (b) Chromatogram of different species of genus Caesalpinia by HPLC-UV. The results of DPPH activity showed that all partitions have significant activity. At the dose of 100 μg, ethyl acetate and n-BuOH showed the maximum inhibition percentage i.e., 78.56% and 88.50 % respectively. Furthermore, TLC analysis showed the presence of more compounds so n-BuOH were selected for further isolation. After repeated open column chromatography using Sephadex and ODS column, eight compounds isolated were further identified by NMR spectroscopy and their molecular structures are presented in Figure 1 (a). Among the isolated compounds, 5 are flavonoids and 1 is benzoxecin derivative, 1 is phytosterol like compound and last one is sappanol compound. The chemical structure of the isolated compounds was displayed in Figure 1 (a). 1: Apigenin-7-rhamnoside: 1H-NMR (600 MHz, DMSO-d6) δ ppm. Ring A: 7.85 (d, 2H, J = 8.1, H-2’ and H-6’); 6.88 (d, 2H, J = 8.1, H-3’ and H-5’); Ring B; 6.78 (s, 1H, H-8); 6.73 (s, 1H, H-6); 6.32 (s, 1H, H-3); 5.11 (s, 1H, H-1’’); 4.46 (s, H-2’’); 3.34-3.71 (m, H-3’’,H-4’’,H-5’’); 1.18 (3H, H-6’’) 13C-NMR (150 MHz, DMSO-d6) δ ppm: 182.3 (C-4, C=O), 164.68 (C-2), 162.94 (C-4’’), 162.05 (C-4’), 161.43 (C-5), 157 (C-8), 128.8 (C-2’,6’), 121.09 (C-1’), 116.41 (C-3’ and C-5’), 105.79 (C-3), 18.50 (C-3’’, C-CH3). 6: 6-hydroxy kaempferol: 1H-NMR (600 MHz, CD3OD) δ ppm: Ring A: 7.87 (d, 2H, J = 8.6, H-2’ and H-6’); 6.94 (d, 2H, J = 8.7, H-3’ and H-5’); Ring B; 6.60 (s, 1H, H-8). 13C-NMR (150 MHz, CD30D) δ ppm: 182.3 (C-4, C=O), 165 (C-7), 161.4 (C-5), 162.05 (C-4’), 161.43 (C-5), 128.3 (C-2’,6’), 122(C-1’), 115.63 (C-3’ and C-5’), 102.5(C-3). Chromatogram of the standards along with the four-species collected from China and Pakistan eluted by HPLC-UV as represented in Figure 1 (b) and comparative analysis as mentioned in Table 1. All compounds are present in C. decapetala which were identified by matching with their retention time in the extract. Furthermore, variations in the content analysis has been found in other species of Caesalpinia. The data showed that highest peak of compound 2 (4-O-methyl episappanol) is found in C. decapetala and C. bonduc. The highest amount of compound 5 (astragalin) is found in C. sappan while Caesalpinia pulcherrima contains highest amount of compound 7 (quercitrin). (a) Alpha-glucosidase activity of isolated compounds from C. decapetala. Values are expressed in mean ± S.D (** p value < 0.02, * < 0.05, n=3). Apigenin-7-rhamnoside (1), 4-O-methyl episappanol (2), Caesalpinol (3), daucosterol (4), astragalin (5), 6-hydroxy kaempferol (6), quercitrin (7), naringin (8), and acarbose was used as standard. (b) PTP1B inhibition activity of isolated compounds from C. decapetala. Values are expressed in mean ± S.D (** p value < 0.01, * < 0.05, n=3). 4-O-methyl episappanol (2), and Ursolic acid was used as standard. Some of these compounds are identified for the first time in C. decapetala and other species along with their HPLC chromatogram. Therefore, the isolated compounds from C. decapetala along with the other species of Caesalpinia were further selected for their antioxidant activity. Antioxidant activity of different species of C. decapetala. Values are expressed in mean ± S.D (** p value < 0.01, * < 0.05, n=3). Active oxygen and free radical role in the progression of certain diseases in human such as ageing of skin and atherosclerosis has been well established. In this study, three free radicals such as DPPH radical, ABTS radical and superoxide anion radical were utilized to check the activities of the extracts and major isolated components from the leaves of C. decapetala. Table 2 and Figure 2 (a) presented the DPPH activity of isolated compounds and extracts of different species. Among the extract of different species, C. pulcherrima collected from China and Pakistan showed the best activity as compared to others in descending order, C.sappan > C. decapetala > C. Bonduc. Among all the isolated compounds, quercitrin exhibited the significant inhibition of DPPH in dose-dependent way. The IC50 value of quercitrin is as follows 48.94 ±0.17 µM. Quercitrin showed the higher DPPH value than trolox but less than AA, positive controls. In the measurement of superoxide anion radical scavenging activity of isolated compounds, hypoxanthine-xanthine oxidase system as a source of superoxide radical was used. The superoxide anion radical scavenging activity of isolated compounds and extracts are mentioned in Table 2 and Figure 2 (b). 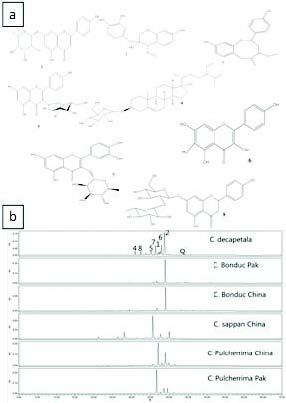 According to condition employed, C. Pulcherrima collected from botanical garden in China and Pakistan exhibited the significant antioxidant activity as compared to others followed by, in decreasing order, C.sappan > C. decapetala > C. Bonduc while among the isolated compounds from C. Decapetala, quercitrin showed the significant inhibition activity 93.39 ± 1.86 μM in comparison with the other compounds but less activity than standard, allopurinol, 92.54 ± 0.69 μM. ABTS radical scavenging activity of the major isolated compounds and extracts as shown in Table 2 and Figures 2 (c). According to condition employed in the assay, among the extracts of different species of Caesalpinia collected from different areas, samples of C. pulcherrima showed the best activity as compared to others followed by, in decreasing order, C.sappan > C. decapetala > C. Bonduc. Among the isolated compounds, only the quercitrin showed the potent inhibition activity as 60.42 ± 0.007 μM.But the IC50 value was less than the standard control, AA and trolox. In the measurement of the α-glucosidase inhibitory activity of isolated compounds, glucosidase enzyme was used. The inhibitory activity of the compounds isolated from C. decapetala as mentioned in Table 2 and Figure 3 (a). 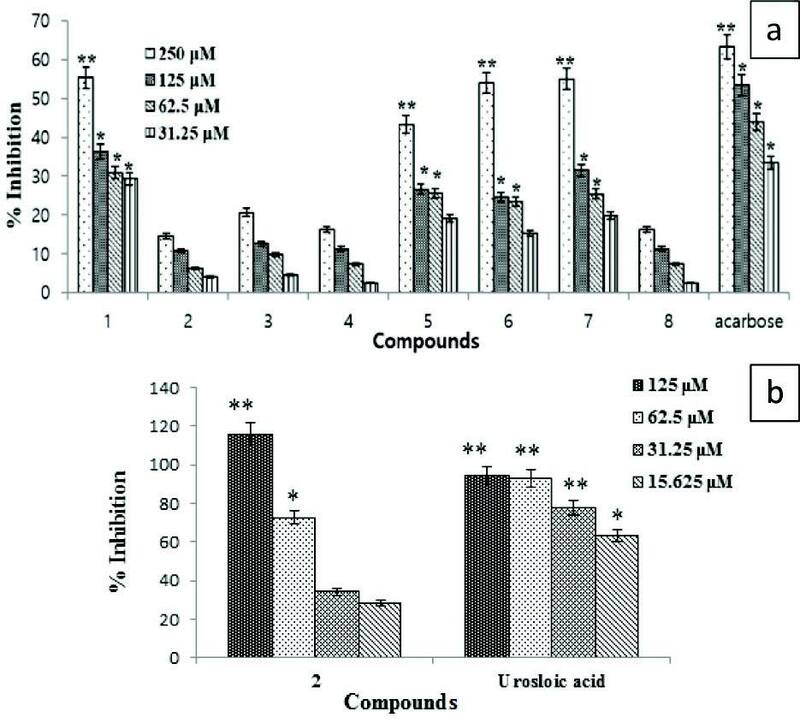 According to condition employed, compounds 1, 5, 6, and 7 exhibited significant activity against α-glucosidase enzyme with IC50 213.4 ± 1.0 μM, 311.8 ± 0.00 μM, 231.6 ± 8.7 μM, and 223.0 ± 0.32 μM respectively in comparison with the positive standard acarbose, (IC50; 127.9 ± 2.0 μM). In the measurement of the PTP1B inhibitory activity of isolated compounds, PTP1B was used. The inhibitory activity of the compounds isolated from C. decapetala is mentioned in Table 2 and Figure 3 (b). According to condition employed, only compound 2 showed the significant inhibitory activity with IC 50 (43.4 ± 1.7 μM), while others did not show any activity against this enzyme in comparison with the positive control, an Ursolic acid having IC50 0.8 ± 1.4 μM. There are many factors which are responsible for the cause of DM such as oxidative stress and enzyme inhibition.2 By finding the natural resources and identification of the responsible compounds, new invention can be made for the treatment of this disease.3 Genus Caesalpinia has been used for a very long time for the treatment of diabetes17 but it was yet to be identified that which active agents are responsible for the cure of diabetes and by which mechanism the bioactive constituents showed activity against DM. One of the main reasons of DM is related to the damage of pancreatic β-cells.18 This damaged is stimulated by the presence of excess amount of free radicals which results in excessive oxidative stress.19 To determine the antioxidant ability of the isolated compounds from C. decapetala along with extract of different species of genus Caesalpinia, we resorted three radical scavenging assay including DPPH assay, ABTS assay, and superoxide radical scavenging assay. Among the isolated compounds, only the quercitrin showed the significant inhibition against DPPH, ABTS assay, and superoxide radical assays. But in the case of extracts of different species of genus Caesalpinia exhibited different pattern against oxidant activity. We observed from our experiments that antioxidant activity against all used assays showed the similar pattern of inhibitory activity in a dose-dependent manner and a decrease in following order C. Pulcherrima > C.sappan > C. decapetala > C. Bonduc. Quantitative and qualitative analysis showed that quercitrin is present in decreasing order as C. Pulcherrima > C.sappan > C. decapetala > C. Bonduc. The property and popularity of the medicinal plants are due to the presence of their more bioactive compounds. As the results exhibited that quercitrin is a most bioactive component in genus Caesalpinia as an antioxidant. Our findings revealed that antioxidant property of C. Pulcherrima is due to the presence of quercitrin. In our investigation in searching for the potential glucosidase inhibitor, all the isolated compounds from C. decapetala were tested against glucosidase inhibition and flavonoids derivatives showed good results. 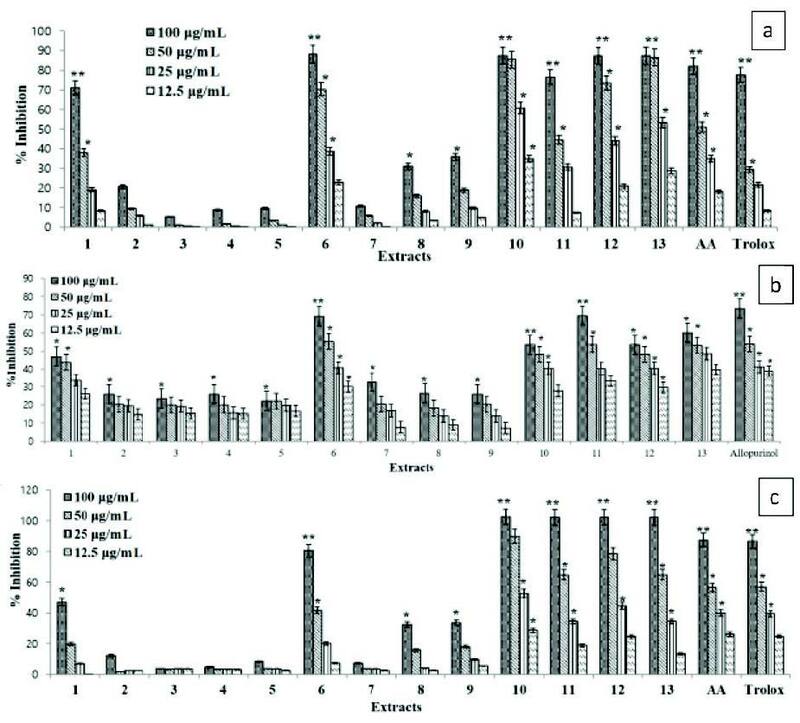 The flavonoid compounds isolated from C. decapetala showed activity at the dose of 250 μM in decreasing order: apignin-7-rhmanoside > quercitrin > 6-hydroxy-kaempferol > astragalin > naringin. Previous studies on flavonoid potency showed that in the α-glucosidase activity, the structure of flavonoid plays a very important role.20 The A, B, and C rings of flavonoids are related to the activity. The linkage of B-ring at position 3, 2,3-double bond, and hydroxylation at position 5 play a critical role and enhance its activity. Literature related to the α-glucosidase activity of flavonoids proves that the inhibitory activity increase with the increase in hydroxyl group on the B ring. But hydroxylation at position 3 on the C ring is unfavorable to inhibitory activity.20-23 Due to the presence of high amount of quercitrin in Caesalpinia pulcherrima, we can suggest that this species is more valuable against α-glucosidase activity for the treatment of DM. In the determination of PTP1B activity of isolated compounds from C. decapetala, the results showed that only compound 2 showed the significant activity in a dose-dependent manner. Therefore, we can suggest that genus Caesalpinia has a potential source of antidiabetic agents which can treat the DM in multiple ways. Future studies may be helpful to explore detailed mechanism of these bioactive constituents in animal models. The present study reveals that quercitrin is the lead bioactive compound and C. pulcherrima is the most bioactive specie of genus Caesalpinia. In conclusion, the biological activities of the extracts of different species of genus Caesalpinia and their bioactive compounds that we have studied were in the alignment with their ethnopharmacological uses. We have explored the phytochemical composition of C. decapetala for the first time and proved its traditional use against diabetes with scientific evidence along with the content determination among different species of genus Caesalpinia belonging to different origins. Consequently, extract of Caesalpinia pulcherrima can be commercialized as a source of antidiabetic agents Furthermore, in-vivo study may help to explore the detailed mechanism about antidiabetic effect of Caesalpinia pulcherrima. Conflicts of interest CONFLICT OF INTERESTAuthors have no conflict of interest to report.